I am super excited to bring you this giveaway from Lands End!! If you’ve never been to Domestic Chicky before, I am a scatter-brained domestic wanna-be, a photographer, and I love sharing all my homemaker-y goodness. Here you will find recipes, crafty stuff, the occasional funny or 80’s flashback video, and most of all links to the fun stuff I find online. I am also The Apronista, where I share my love of Aprons and give other Apron lovers and creators a place to list their shops and other Apron – love. There is a great Giveaway going on there too-you could win an apron from the lady who made Bree’s Cookbook cover Apron on Desperate Housewives! Ok so back to business! I am sure you didn’t come here to listen to me natter on about myself – this is All about YOU! Land’s End is one of those companies you associate with well made clothes – I have had Jackets from Land’s End that have lasted me years! I just got a black Weatherly jacket that I ADORE! It’s attractive AND warm, and although it never gets down to -5 here in California, the jacket isn’t so heavy that you are sweating to death in warmer temperatures. Nice, right? So what do you have to do to win this yummy fleece? Easy – just go check out the fleece, and choose your favorite color. Come back here and leave a comment with your choice…That’s it! I think I like the baby blue one best, but that Chocolate brown looks pretty yummy too! Entries will be accepted til 9PM PST Friday October 31st, and the winner will be chosen by random number generator and announced here on Monday. Thanks for stopping by and Good luck! Also! Lands’ End would like to make planning family holiday get togethers a whole lot easier this year by giving you a chance to win a great family get together for 7 nights for up to 12 people at The Resort at Paws Up in Montana! The contest kicked off September 30 andLands’ End will accept entries at www.landsend.com/greatgettogether through noon October 30, 2008. Third Prize: Fleece Great Get Together package with cozy fleece jackets and accessories for the family. To enter, fill out the online entry form and submit an up-to-300-word essay and photo. Don’t forget to check out all the other yummy giveaways at the Bloggy Giveaways Carnival!! Just discovered your site via the Farm Chicks. It’s great! Not just a destination, but the beginning of an adventure . . . I never realized how many creative people are out there online. Love the fleece too! I’m a Dark Charcoal Gray type. I love the plain black one. It’s simple and would go with anything. Land’s End jackets are sooo comfortable. I don’t own one (yet), but my coworker just bought one, and I love how soft it is! Bright Pistachio is my fav. Perfect for my winter in NH! I think pink would be so cozy. As much as I love Autumn Orange, I would have to say Natural would be the most practical. I would choose Natural. Ooohh…I love the Bright Pistachio one! I love the Coral Pink — I can image the snuggly feel right now!!! I love the autumn orange and baby blue! Thanks for the awesome giveaway. I like the vivid plum. It is indeed vivid. Thanks for offering a great giveaway! What a great giveaway! I love the Bright Pistachio. Just my color! Spice Brown all the way!!!! I’m torn between the Admiral Blue and the Dark Charcoal Heather. Looks snuggly warm and would just the thing to help me get thru the winter! I love the light coral pink! Thanks for hosting a giveaway! I have one of these in Pistacho and can I just say Yum. It’s perfect for fake winter here in N Florida. This year I think I will be digging the Vivid Plum! This does look snuggly! I would say the light khaki ones looks really cute! You are going to be SHOCKED! by this – but Charcoal Heather. So many great colors!! I think I like the brown or pink best! Dark Charcoal Heather! It looks so warm and cozy! Thanks for the giveaway — my pick is the charcoal gray! Wow, those are some great color choices. I particularly liked Vivid Plum. I’m stuck between the Spice Brown & the Autumn Orange. Decisions, Decisions! I like the plum and the khakhi :). Cozy!! I like the black one! Light coral pink for me, since this would be for my 16yo daughter who LOVES pink! I am torn between the light coral pink and autumn orange! I like the Spice Brown fleece. I’m having a hard time picking. Normally I’d grab black so I could wear it with everything, but I love the Spice Brown and the Light Coral Pink. I love the natural one. I am a sucker for neutrals! I’m torn between the Light Cove Blue and Vivid Plum. I like the spice brown. I like the pistachio. a lot actually! Black is my choice! It’s perfect for our New England weather!! I’m absolutely digging the chocolate brown. And a great spill-hiding color it is. I like the Dark Charcoal heather one! Nine times out of ten, I would say Bright Pistachio, but today I’m feeling Autum Orange. Black is my favorite! It hides flaws-lol! I’d go with Cove Blue though I’m also partial to the darker blue and the pink! Maybe I need one of each. I’d love the spice brown. thanks for the chance! I love the Spice Brown one. I just love brown! It has to be the Vivid Plum. Wow, I love the black!!! I would go for the light cove blue!!! I’m torn between admiral blue and spice brown. I love blue but I’ve been getting more into brown of late. I’ll be adding a giveaway on my blog by the end of the night. I love the light coral pink! I’d have to go with the Vivid Plum. I’ve always been a purple kind of girl. I like the vivid plum best! Soo cozy I need this now its already chilly here! While the vivid plum is beautiful, I love the pizazz of the bright pistachio. It is such an awesome color. Admiral Blue or Vivid Plum. I love the bright pistachio! What a cool giveaway! Spice Brown is my fave! Thanks for the great giveaway opportunity! Dark Charcoal Heather looks very nice! Bright Pistaschio is wonderful! Thank you! I like the autumn orange. I love the blue one too. But I think I’m going branch out and say the chocolate brown. I like the baby blue too. Thanks for the chance to win! I love the Autumn Orange! I am really needing a pullover for the season and I hope I win! I like the light pink one. Thanks for the giveaway! I love the Dark Charcoal Heather- thanks for the chance to win! This looks so nice and toasty! I’d love to win one in admiral blue. That royal shade of purple is stunning… but in the end I just might have to pick the practical black 🙂 They sure look toasty! Love the spice brown one! Great giveaway! i’m loving bright pistacio and chocolate brown! I think I would choose chocolate brown. I don’t own enough brown and it’s a good fall color. Thanks! Either the vivid plum or light coral pink. I can feel the softness now. Howdy from Ak. We have tons of snow already – this would come in handy in keeping me warm in sub zero temps! If I win surprise me with the color – I like them all!! 🙂 Thanks for the chacne to win! 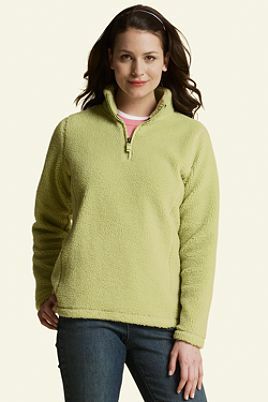 I love lands end and I am loving the natural color fleece! I would pick pale khaki or spice brown. I like to stick to safe colors, but if I got a wild streak, I would be all over the autumn orange! I like the Light Cove Blue, such a nice color. I would love it in natural. I like the spice brown! Vivid Plum is my favorite! I like the admiral blue. They sure look warm! Thanks so much for the chance to win! You can bet I will be visiting your blog again! I would choose Spice Brown. Admiral blue or spice brown for me! I like the Dark Charcoal Heather, but the Spice Brown is nice, too. Chocolate brown…or Autumn orange…both are very Fallish 🙂 Thanks for the chance to win! I would love it in vivd plum or maybe black. Thanks for the great giveaway. I really like the color Spice Brown, great for fall! I love the Pale Khaki. I’ve had my eye on that fleece for awhile. I hope I win! My favorite color is Admiral Blue. since they don’t have a red, I’d probably go with admiral blue. I like the vivid plum. The natural color fleece is my favorite. I love the autumn orange!! Your blog is so appealing to me…and so is that fleece!! Man, it`s cold outside today and I really need that bad boy. I would choose the spice brown, second would be the vivid plum. dk charcoal gray for me please!!!!!! I like the Admiral Blue and spice brown. I love the Bright Pistachio! Thanks for the chance to win your great giveaway! My favorite is the natural! I love the chocolate brown and the pale kahki. Thanks for the chance! The Spicy Brown is my favorite color for this season! Black…I really dont have any black…so it would be nice to add some to my closet! I like the vivid plum colour. I love the Dark Charcoal Heather one! I love the coral pink, size large. Such nice fleeces! I love the Vivid Plum one the best! I have one of these from Old Navy and they are so great for fall! That yummy Spice Brown has my name all over it. Love that color! Thanks for the chance to win it. I like the Dark Charcoal Heather Gray Color! What a cool giveaway! Thanks! I ADORE Lands End clothes! Been a fan for 25 years, LOL! I’ve been drooling for one of those sherpa fleeces too – Vivid Plum, please! Thanks for a great giveaway. This rocks. I love the light coral pink best! These look so comfy! I like the Bright Pistashio or the Burnt Orange. Thanks for the chance! I love the Autumn Orange -yeah! I love the Admiral Blue. totally love the dark charcoal heather!!! Chocolate Brown so pretty and sounds yummy too! Thanks so much for the AWE-some Give-oh-Way! I like the dark charcoal heather shade. I would love the black one…I like things simple and this would go with everything I own. I really like the charcoal or the pistacchio one. Lot’s of great colors but the Bright Pistachio is my favorite! Natural for me. Perfect for winter in Milwaukee! Vivid Plum would be my pick! Thanks. Loving the vivid plum, but the admiral blue is also soooo pretty! I just saw this in a catalog the other day. Natural or Vivid Plum are my favorites! Thanks for the chance to win! My fave color is dark charcoal heather. Hummm, tough choice but I think I would go with brown. What an awesome prize, thanks for the chance to win! The Light Coral Pink would be my pick! My favorite one is light cove blue. i love the admiral blue…everything else here is pink, seems like! I like the vivid plum! Great giveaway! I love the Admiral Blue! I would choose the vivd plum. I like the light coral pink. Either admiral blue or vivid plum for me 🙂 Thanks! I really like the admiral blue! thanks! I love the light cove blue followed by autumn orange. Autumn Orange is rocking…love it! Vivid plum. It makes my eyes look greener. I would love the dark charcoal gray or the plum color. I like the natural and the khaki colors. Great for the cold winters here in Denver. I love the Vivid Plum, but it was hard to choose! I like the khaki. thanks for a chance to win. I like pale khaki the best. Love the light cove blue. spice brown is my favorite. It would look awesome! I like the Admiral Blue. I like the Dark Charcoal Heather! My fave color is light coral pink. Thanks for the giveaway! I like the dark charcoal heather. I sure could use this. My winter coat has bit the dust and its cold here in MN! Thank you! I’d probably choose black as it goes with just about everything. The pullover looks so comfy. I really like the vivid plum! Thanks for the giveaway. Thanks for the great giveaway and chance to win! Oh, how warm and cozy. I’d love the plum. This is a terrific giveaway Chicky! It’s gettin’ coooolld here in KY…I’d pick the cove blue. Pretty! I love the black and brown. I would totally go for the Admiral Blue! Love it! I’d choose the spice brown! i like the vivd plum! Great giveaway! i like the dark charcoal heather color! I love the vivid plumb one. That looks so comfy. Thanks for the generous giveaway! I like the Pale Khaki! Coral pink for me please. Hm…the admiral blue and black both look very tempting. I think I’ll lean towards the black, the blue is not deep enough for me. Oh totally the pistachio green! What a great colour! I would go w/ Black! I love the Charcoal Heather! I like the Spice Brown!! I would have to pick Light Cove Blue closely followed by Bright Pistachio. I just love that Autumn Orange color! Admiral blue! And I’m so entering that Land’s End contest, thanks for the link! I think the Light Cove Blue is my favorite. I really like how rich the vivid plum is!! I like the Khaki color best! Thanks! Light coral pink for me! Thanks for the great giveaway. I adore fleeces.. I love the Admiral Blue color-so pretty! I love the Spicey Brown color. Thanks so much! The vivid plum is calling my name! My wife would love the vivid plum – pick me pick me! I like either the Admiral Blue or the Spice Brown one. So comfy lookin’! I like the admiral blue! May Canadians enter? I love the Black. My favorite is the light coral pink. I like the light cove blue. I’d definitely go for dark charcoal heather! The black one is what I’d get. Since I’m not a blogger yet, I’m trying to send traffic to view my eHow articles that I’ve written. After you check out the link below you can click on “see my other articles” in the box on the upper top right hand corner. I know I could use more color in my wardrobe but I absolutely love the Dark Charcoal Heather. Thanks! I like the pale khaki. I would probably choose the dark charcoal heather. Thanks for the giveaway! Oh I love the light cove blue. I really liked the pink one but this color looks best on me. I’d like the fleece in black. Love Lands End! Thanks for the opportunity! I’m a Bright Pistachio fan myself. Thanks. What a great giveaway! I just love the Admiral Blue! Thanks! I love the dark charcoal heather one! This pullover looks so soft and warm and snuggly. My fave is admiral blue! I’ve been buying from Lands End for year, love ’em! Spice Brown for me! Vivid Plum is very nice! I love the light coral pink or the pale khaki. Nice!!! Oh, I love the Vivid Plum color. I love the light coral pink one. Great giveaway! Thanks!! Black. I could wear it with so many things. I was just drooling over the sherpa pullovers that I saw in their catalog a few days ago! There are so many great colors, but my favorite is the charcoal gray. I’ve always loved charcoal gray, it seems so cozy to me! I really like the Light Coral Pink! It looks so soft, warm, and cozy! Looks warm and cozy! I like the plum. Thanks. Bright Pistachio for me, all the way!! THANKS!! Call me boring, but my favorite color for the fleece is black, but I might go a dark charcoal grey! I like the spice brown, but the pistachio is very close – Thanks! I would choose the Admiral Blue one. I need a new pullover like this one! Thanks for the chance to win. LOVE the Spice Brown! Thanks for the chance to win! I think I’d go with the pistachio. Something I wouldn’t normally choose. But I love the color. The `Sherpa Fleece Pullover` looks great. I would Love a Black one. Please enter me for the giveaway. I also like the `My virtual model` at Land’s End. I don’t like buying clothes online. Because I prefer to try them on. I’ve never used a `Virtual Model` but it looks interesting. I like the plum fleece best of all! I like the Spice Brown color. I love the Autumn orange or the Admiral Blue. Both are great! I would love the spice brown. Thanks! I like the charcoal heather. Thanks for the giveaway! Vivid Plum for me . Thanks! I like the pale khaki color. I love the chocolate brown one….God Bless! hmmmm…..i’m thinkin’ the chocolate brown might be the ticket!